Home » VUE » Did you know that the VUE is being used in restoration of a World War II submarine? Did you know that the VUE is being used in restoration of a World War II submarine? 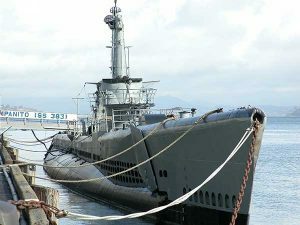 The USS Pampanito, a World War II submarine, is well known for having made six patrols in the Pacific during WWII. The Pampanito, now a museum and memorial, has been docked at Fisherman’s Wharf in San Francisco, CA, since 1981. It is open to the public where it educates approximately 4,000 students in day and overnight programs annually, and 100,000 visitors a year who tour the boat. It is currently undergoing important restoration and replication projects to bring it as reasonably close to its original operational condition as when it sailed in the summer of 1945. 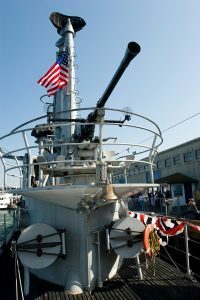 The project is managed by the San Francisco Maritime National Historical Park Association, and includes work to refurbish everything from old and/or missing parts, as well as repairing original historic artifacts. Maintaining the submarine as a non-profit is a huge challenge, and the Maritime Park Association relies heavily on donations to further is goals of bringing maritime history to life, offer future generations its important teachings, as well as honor the men that served there. To that end, when HEIDENHAIN staff learned that the project received an old Bridgeport mill from a local machine shop as a donation, and that the 1980 digital readout on it was broken and obsolete, they approved the donation of an ACU-RITE VUE 2 digital readout kit. The VUE came with two SENC 150 scales and accompanying brackets. This DRO kit should help the mill come back to life. “We were very happy that someone at HEIDENHAIN / ACU-RITE took the time to understand our mission and donate this DRO,” said Rich Pekelney, one of the Maritime Park Association’s trustees and volunteers. “I’ve been doing hands-on restoration like this for 23 years, and our small machine shop is a vital part of our project. The well-used Bridgeport mill received by the Maritime Park Association is a classic 42″ table type. “We know that DROs have great value on any manual milling machine in order to do accurate work, particularly on older ones which might have a little more side-play or backlash, so this DRO is very much appreciated,” explained Pekelney. 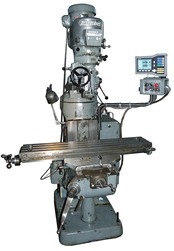 “We were familiar with ACU-RITE DROs and our machinists have experience with them. We know they are easy to use and reliable products.